I’m on an Oh She Glows tangent right now..between her smoothies and soups, she is making a regular appearance in our kitchen! You may have done a little eye roll when you read “Vegan” but really give this a chance! If vegan is way out of your comfort zone, don’t fret….add some meat and it’s all good! 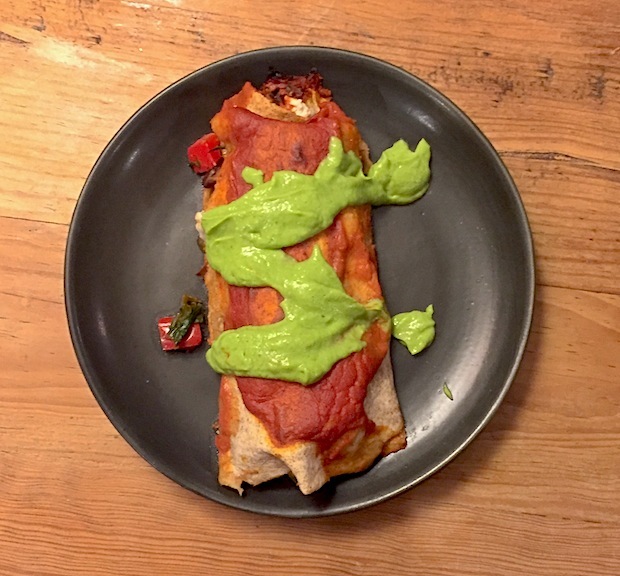 On the other hand, you might just completely surprise yourself with how delicious and hearty these enchiladas are just as the recipe calls for. To keep Scott from having heart palpitations associated with the word vegetarian, i did roast a couple of boneless, skinless chicken breasts and added some to his enchiladas. I couldn’t deal with his stress. The avocado sauce is. so. good. Like, extremely good. 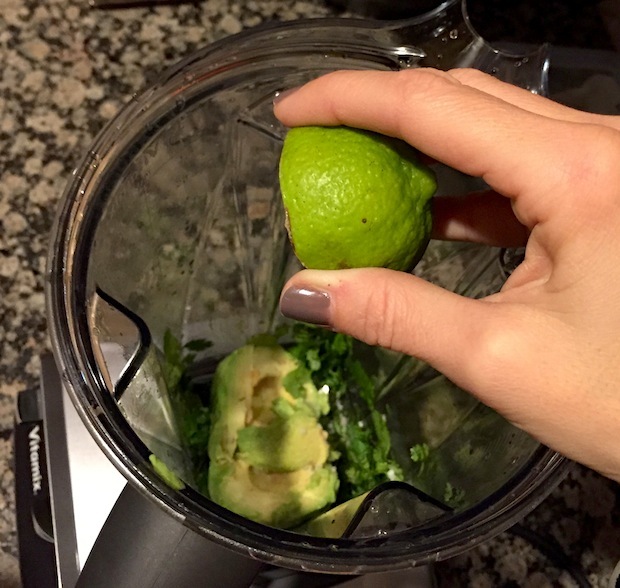 Avocado, cilantro and fresh limes are the perfect combination every time. I used the leftovers on my eggs the next day…yum! This meal is impossibly messy, and delicious at the same time. Something so “saucy” is usually unhealthy. So enjoy the soaking up the avocado sauce…because its full of healthy fat. Don’t mind the picture quality…i cannot wait until the days stay light long enough for me to prep dinner.. until then, this will have to do! We also may have been a bit heavy handed with the avo sauce but there’s not one bit of regret! 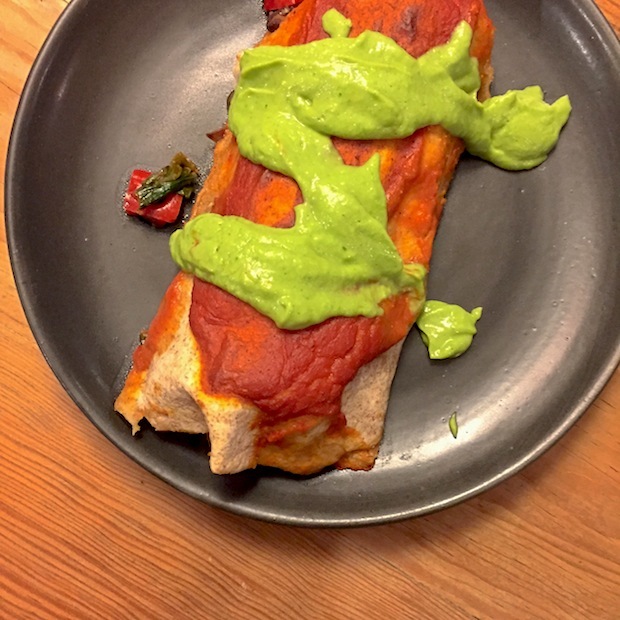 One last note…in a time pinch use store bought enchilada sauce but if you have 5 (and i mean only 5) minutes, make the 5-minute enchilada sauce..it’s the piece de resistance here! Preheat oven to 350F and grab a baking dish large enough for 4 enchiladas. Pre-cook the chopped sweet potato, by simmering it in a small pot of water for about 5-10 minutes until just tender. Do not overcook. Drain and set aside. In a large skillet or pot, add 1 tbsp oil and bring to medium to low heat. Add in the chopped onion and cook for about 5 minutes, stirring often, until translucent. Add in garlic and reduce heat to low and cook for a couple more minutes. 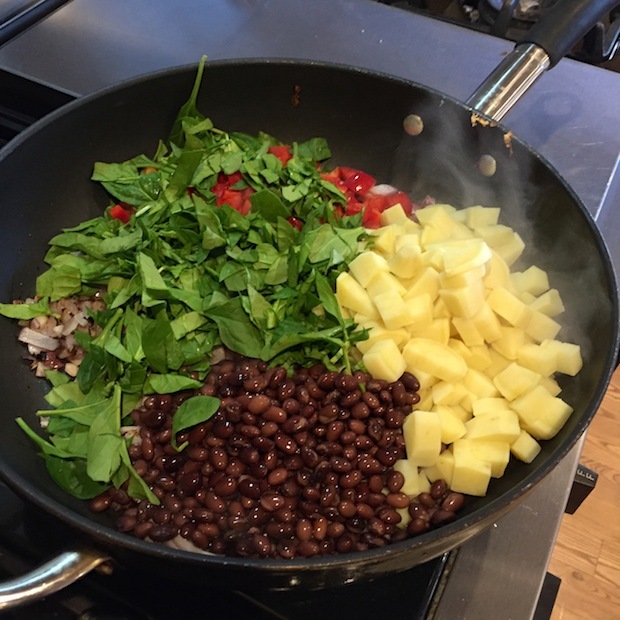 Now add the chopped pepper, pre-cooked sweet potato, drained black beans, and chopped spinach. Cook for about 5-7 more minutes on medium-low heat. Now add in your enchilada sauce. If making your own, melt butter over medium heat. Stir in the tomato paste, followed by the broth. Whisk until smooth and bring to a low boil over high heat and then reduce the heat to medium to matin a simmer. Stir in salt to taste and simmer for about 5 min until thickened. **i actually threw all the ingredients into my Vitamix and blended it. Then transferred to a pot, brought it to a boil and then simmered until thickened. 5 minutes! 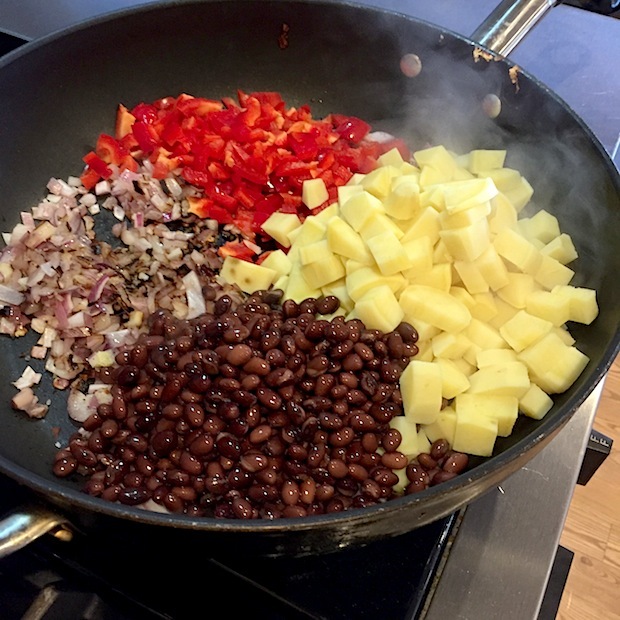 Stir well, and add in your seasonings: cumin, fresh lime juice, salt, garlic powder, chili powder- all to taste. Adjust seasonings if necessary. Stir well. Scoop about ¾-1 cup of the mixture onto the bottom of your casserole dish and spread out in a thin layer. 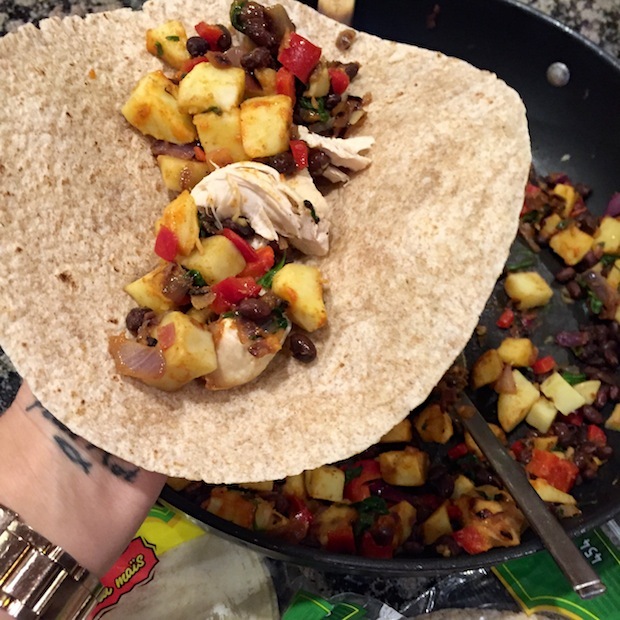 Scoop about ½-3/4 cup of the mixture onto each tortilla and wrap, placing the fold down on the casserole dish. Repeat for the remaining 3 tortillas and leave a bit of filling left to spread over the top. Sprinkle with vegan cheese if preferred. Bake tortillas at 350F for 18-20 minutes. Meanwhile, make your Cilantro cream sauce: In a food processor or blender, process the avocado flesh and water until creamy. Now add in the rest of the ingredients and process until smooth and well blended. Use immediately for best results. When enchiladas are cooked, remove from oven and pour the sauce over top. Garnish with chopped cilantro and green onion. Serve immediately.